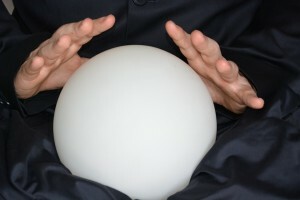 At the oustet of every year, pundits, experts—and let’s not forget charlatans—roll out their predictions. It’s a relatively safe endeavor, since not many people bother following up a year later to see how they fared. That may be an indication that people view predictions as entertainment more than as actionable items. In the case of predictions that don’t pan out, that’s probably a good thing. The safest prognostications sound gutsy but on examination aren’t. If you want to convince your friends that you’re a psychic, just predict that 2019 will be a year of great political upheaval. No matter where you live, you will not be wrong. Or predict lots of earthquakes, since according to Incorporated Research Institutions for Seismology (IRIS), “Magnitude 2 and smaller earthquakes occur several hundred times a day world wide.” Just don’t pin magnitudes to specific locales. • The threat of digital payment platforms from non-traditional banks will grow. • Technology will be a major expense area for financial institutions. • Banks will continue talking about the importance of relationship management as if they are good at it. • Investment in AI will grow. • The arms race between security gurus and hackers will escalate. • Major data breaches will occur in companies you wouldn’t expect. • We’ll hear less about blockchain. • Banking regulations will ease, but no one will relax due to the upcoming 2020 election. • Branches will continue to close, due not to digital banking but to geographic overlap. Safe and obvious as the above predictions may be, I have decided to go out on a limb and add three more specific developments I foresee for 2019. I don’t pretend they’re earthshaking. It’s just that with the above list and no shortage of predictions industry-wide, there’s not much left that hasn’t been covered. In 2019, marketers forced to comply with Mastercard’s new policy on free trial subscriptions will act like it was their idea. Book of the Month Club proved early on that negative response (“We’ll send you the product and bill you unless you tell us not to”) makes money on inertia. The modern iteration is the web-based free trial offer. Customers, after providing a credit card number, must remember to bail on time, often a labyrinthine process, to avoid charges. Mastercard has called an end to the practice. From now on, merchants must send a detailed invoice with clear cancelation instructions ahead of the expiration date. With no choice but to comply, you can bet merchants will present the policy as their own, touting it as evidence of their commitment to customer service. In 2019, Zelle will surpass Venmo in enrollments and use. I admit it doesn’t take much of a futurist to foresee Zelle’s dominance following its leaping and bounding through 2018. Indeed, industry watchers predicted that Zelle would have surpassed Venmo by now. Even so, it’s by no means a sure thing. Venmo cannot be expected to sit idly by. For all I know, it stands at the ready to pull a rabbit from its hat. My money is still on Zelle. Pun intended. In 2019, user adoption of voice-activated digital banking will plod, but banks will continue adding it to their offering. Voice-activated banking offers a good deal in the way of convenience. Trouble is, customers are slow to embrace it. Perhaps that’s because digital banking is already pretty danged convenient, making promises of additional convenience seem almost trivial. That may be why Numerica Credit Union, which last March became one of the first financial institutions to offer voice banking, has enrolled only 1,000 out of its 145,000 members. Still, one cannot afford to trust that voice banking will remain sluggish forever. To hedge against being caught unprepared in the event it catches on, banks will continue adding it to their mix. But I think the product will pretty much sleep through 2019. There you have it. I would urge you not to check back in a year to see how I did. Trust me on this: If it turns out I was right, I won’t be shy about letting you know.